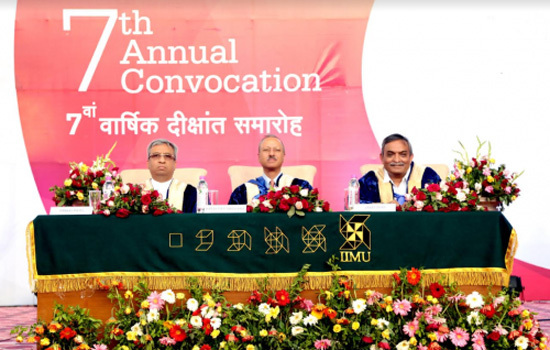 Udaipur: Indian Institute of Management Udaipur conducted the seventh convocation event on March 30th, 2019 at its campus in Udaipur. Total of 239 students received MBA degrees and diplomas in global supply chain management. More than 700 guests comprising of students, parents, alumni, faculty and staff members attended the convocation. Harsh Pati Singhania, Managing Director, JK Paper Ltd. was the chief guest for the event. In an inspiring message to the graduating students, he said, “The ability to unlearn is as important as the ability to learn. As you become successful, as you grow, do remember, there are others who did have the privilege to be in your shoes and it’s our responsibility to give back to the society. Think, whatever we do how can we do in a more sustainable and efficient way”.